Looking for a hotel that does everything just right AND allows you to immerse yourself in Milwaukee’s brewing history? Then you belong at the Brewhouse Inn and Suites in the newly renovated Pabst brewery complex. As a boutique hotel designed to meet the needs of both extended-stay guests and those only passing through for an evening, the Brewhouse Inn combines the best features of an apartment with those of a hotel. The fact that it is a historic building in an area that is rapidly becoming one of the city’s hip new neighborhoods is just icing on the cake. At the Brewhouse, we’ve taken the idea of a simple stay and turned it into a historic, memorable, and genuine Milwaukee experience. Modern comforts. Artful décor. Unparalleled service. Thoughtful green initiatives. These aren’t extras, but simply the way we run things. All-in-all, the Brewhouse is a collection of everything that makes Milwaukee famous—including the brew. After all, what could be more Milwaukee than sleeping in a historic brewery where you’re welcomed by the stained glass visage of the patron saint of beer brewing? Prost!! The original brewery on this site was built in 1844 by Jacob Best as the Best Brewing Company. (It wouldn’t be called Pabst Brewing until 1889.) The building that houses the Brewhouse Inn and Suites was constructed in 1877, making it one of the oldest buildings on the site. This is where the beer was brewed for what was then (and would remain for many years to come) the largest brewery in the USA. Today this historic brewhouse has been lovingly transformed into an elegant, comfortable hotel that celebrates its past. That beautiful blend of past and present is obvious as soon as you enter the hotel, where rough industrial walls are painted in subtle blends of iridescent gold, silver, copper, and blue. The front desk is a modern construction primarily created out of bottles – beer bottles, of course. It’s said that the construction workers on the hotel project were sent home each week with a case of beer to empty for use in that front desk. That might be more urban myth than fact; however, Pabst workers here were provided an allotment of free beer during the work day, so providing free beer to workers undertaking the facility’s renovation would have been historically appropriate! Back in the day Pabst workers (and the local police) took their beer breaks in the Blue Room – the same room where hotel guests have breakfast today. While beer is no longer served there (it’s available just down the hall in the adjoining old Pabst mill, where Jackson’s Blue Ribbon Pub offers an extensive list of beers from Milwaukee and far beyond), there are still plenty of beer bottles around – including the ones ground up to form the breakfast room counter. Take another look around – or, more accurately, up – to see more of the building’s past embedded in the ceiling. Those copper domes are the top of the original brewhouse kettles. If you head up to the hotel’s second floor lobby you can get a better look at them from the other side. I’m not sure these are the original kettles (built from Phillip Best’s designs by coppersmith AJ Langworthy in exchange for free beer for life), but even if they aren’t, they were surely based on that design. They are housed in the space that was the heart of the brewery, a fact celebrated by the giant stained glass window featuring King Gambrinus, the “patron saint” of beer, offering a toast. A couple of monitors in the lobby run a couple of videos well worth watching. One is about the restoration of the brewhouse, including images of the building prior to restoration. The other loops a series of televised beer commercials from days gone by that says a lot about changing cultural norms and tastes. Watching them today, most seem quite ridiculous. The Brewhouse Inn has amazing public spaces, but guests will quickly find that the same level of attention went into the guestrooms – each of which offers well-thought out features and comfortable, elegant furnishings. The complete kitchen found in every room makes the makes the Brewhouse Inn unusual for a classy boutique hotel. While unobtrusive, it has everything a guest could need, including a full-size refrigerator with a real freezer (I always seem to be in need of a freezer), an assortment of pots and pans, a full set of dishware, and a dishwasher! It’s convenient for reheating leftovers without worrying about making a mess and more ambitious guests could easily create a full “home cooked” meal. Travelers with children would find it ideal for preparing snacks or appeasing fussy eaters. The decorations and furnishings also make the Brewhouse Inn stand out from other hotels, with rooms that are thoughtfully fitted into the converted space (no two floors are alike and almost none of the rooms are exactly alike) and furnished with an elegantly eclectic mix that makes the most of that space. All rooms include a few custom built furnishings – headboards, tables, and other items made from materials salvaged during renovation and given new life as part of the hotel’s furnishings. All rooms also have ample outlets where you need them and enough space to set and charge devices (and get some work done). This functionality is a much-appreciated feature in a day and age when so many hotels seem to be doing away with work surfaces. Most rooms are suites, with glass doors depicting a frothy beer separating sleeping areas from sitting/dining/kitchen areas. A couple of rooms have wonderful private terraces. However, even if you don’t have your own terrace, there is a one available to all guests. And, of course, there are views of the surrounding area and city beyond from the windows in every guest room, like these from my own room. During warmer weather there is also an outdoor patio and beer garden. Other features include free WIFI, a serve-yourself breakfast bar, a fitness center, an inexpensive guest laundry, and a full room service menu from Jackson’s Blue Ribbon Pub. The area around the hotel is well-served by transit and public parking is available in nearby parking ramps, although the hotel’s valet parking service is a convenient option. I love the Brewhouse Inn. 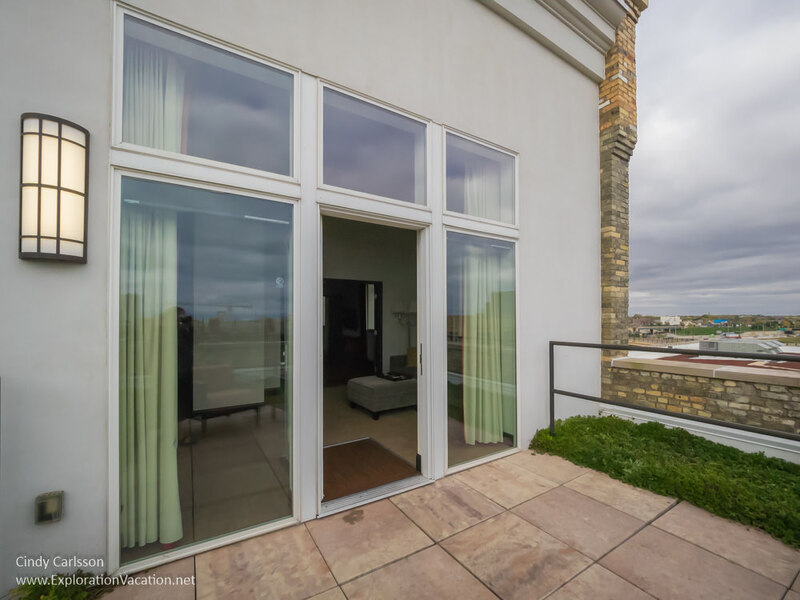 It has a wonderful mix of luxury, practicality, and history conveniently located in a sustainability-minded neighborhood at the edge of downtown Milwaukee. Make plans to visit now, as I suspect rooms at this gem are going to be a lot harder to come by as the surrounding neighborhood becomes more well-known! I had the good fortune to stay at the Brewhouse Inn and Suites as a guest of the property, however, as always, all opinions are my own – I think this is a great hotel. All that searching for blueberries can really work up an appetite, so it is good that the Trestle Inn isn’t too far away!